The intimidating MA770 is a monster of a speaker. Coming in at 16 inches wide, 10 inches deep, and 20 inches tall, the MA770 weighs 35 pounds. For comparison, a standard 8x8x16 cinderblock tips the scales at 37 pounds. On the front is a trio of speakers built into the unique cement body. Along the bottom is an understated brushed-aluminum bar that houses the controls towards the right side. The standard power, optical audio, and 3.5mm audio inputs make up the rear of the device. They are slightly recessed into the body, making them somewhat hidden unless you are looking for them. Of the three speakers built in, two are 4-inch woven Kevlar long throw woofers and the top is a 1.5-inch titanium tweeter. Titanium is usually included with slightly pricier speakers for its lightness and durability over the cheaper aluminum. Master and Dynamic partnered with renowned architect Sir David Adjaye to design the MA770. That is where it gets its seamless design and sweeping curves. "This speaker is not about the traditional idea of making boxes, but about a directional form," said Sir David Adjaye. "I became fascinated with the idea of using triangles to break down the mass of the box, and to see if we could dissolve the sense of volume through sculptural detail. We created a new geometry for this speaker. A new geometry of sound." The speaker looks fantastic and catches anyone's eye when they enter the room. We've had countless people inquire about it in our time owning it. it is certainly a centerpiece that demands attention. The front prominently displays the bare speakers, though a magnetically attached grill can be shown instead. Master and Dynamic actually hides the magnets within the cement itself, so no external blemishes are visible when removed. Like us, some people may have issues properly placing the MA770. Because of the large footprint, it is hard to put at an angle. Concrete was an interesting decision, and we aren't sure if it is purely a marketing gimmick, or something genuinely useful. Master and Dynamic created their own proprietary concrete composite so they could tune its acoustic qualities to their needs. Cement afforded them benefits such as reduced resonance as well as increased dampening over wooden cabinets. We particularly noticed how well it was able to dampen loud sounds at high volumes. Others would cause tables to shake or the floor to vibrate but not the case with the MA770. If you are playing this on a table side-by-side with a record player, keeping vibrations to a minimum is key to prevent skipping. There are a multitude of ways to get your tunes cranking through the MA770. If you prefer the wired route, TOSLINK optical and 3.5mm audio ports are available, which should handle most sources there. If you've got the standard red/yellow analog audio, a simple adapter can be picked up to work over the 3.5mm port. Wireless, which is how most people will utilize the speaker, has a few options as well. Music can be streamed over Bluetooth, which unfortunately is limited to version 4.1, rather than the more current and capable 5. Since this was in our home, rather than outside, we had fewer issues in our open-floorplan home. If you have many obstacles (i.e. stairs, doors, walls), Bluetooth may be an issue. Unfortunately, the most glaring issue is the lack of Apple's AirPlay. The MA770 came to market before AirPlay 2, so that omission is understandable, but it is still unacceptable when Wi-Fi capabilities are present and yet AirPlay is not. AirPlay has been around many years and is popular with many Apple users and is a perfect fit for an in-home Wi-Fi speaker. 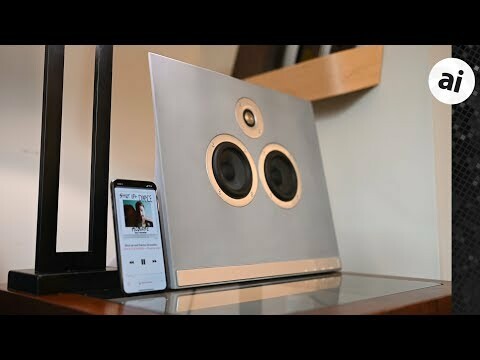 Other, less expensive speakers, such as the Marshall multi-room line we reviewed with Chromecast and AirPlay support. AirPlay or not, what matters most is sound. Luckily, there are little to no complaints in this area. It has the standard M&D sound profile with distinct definition between mids, highs, and lows. At the inset of Baba O'Riley, I had concerns, until the bass really kicked in and so did the clear distinction between the punchy mids and the booming lows. There was an astonishing amount of detail in the music, especially when listening to live/acoustic tracks with subtle nuances often lost in lesser speakers. We've seen in the past Titanium tweeters putting out a bit of a tinny or harsh tone on the highs, but that wasn't our experience with the MA770. We couldn't turn the volume of the MA770 up completely due to the sheer volume this thing puts out, but even as it reaches the higher decibels, there was no issue or distortion notable. Simply put the MA770 sounds like a studio-quality speaker which is exactly what you'd expect with this price range. The MA770 is capable of playing back stereo sound, but it really is a single piece so there isn't nearly the level of stereo separation you'd find with a pair of actual stereo speakers, but that is all the reason to pick up a second one. There is no getting around the eye-popping price tag of the MA770. It immediately takes it out of consideration for the vast majority of shoppers looking for an in-home speaker. The lack of AirPlay can be a problem, if that's your bent. But, even lacking that, we love the MA770. The sound is rich, enveloping, and we are sure -- if paired with a second -- would be neighborhood-shaking at max volume. If you happen to be looking for studio-quality sound that also doubles as an eye-catching art piece, you can't do much better than the MA770. Even lacking AirPlay, AppleInsider gives the MA770 a 4.5 out of 5 for sound quality, presentation, and technology alone -- assuming that you can afford it. If you'd like to up your music quality by picking up the Master and Dynamic MA770, you can do so by special order from B&H for $1,800. "Concrete was an interesting decision, and we aren't sure if it is purely a marketing gimmick, or something genuinely useful." One of the biggest issues with speaker cabinets is vibration that leads to unwanted harmonics, resonance and distortion. Something like cement has the density to dampen those unwanted vibrations and should, along with the cabinet design, result in a very clean and controlled sound. There are other companies using cement to cast speaker cabinets. This encourages me to continue developing my bale of hay speakers. I’m planning two models, square and round. Love to see non-traditional approaches to quality design! The weight of the casing is an important factor in creating great sound that many manufacturers try to bypass on, likely to save costs in manufacturing and shipping. Factoid — Cement and Concrete are not interchangeable terms. Cement is an ingredient of concrete. Cement is a powder. Concrete is the final product after water and aggregate are added. Heavy cabinets are one way to go. Equally successful are well damped very lightweight cabinets with a resonant frequency well above the audio range. $1,800. You have to say “no” to a lot of other choices at that price. $1800 and no airplay? no way.